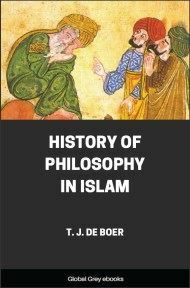 This is a well-written and authoritative review of the history of Islamic philosophy during the middle ages. Medieval Islamic civilization at its height was a center of learning, and its philosophers were no exception. Islamic philosophers grappled with issues such as free-will, causality and the nature of reality. Some of these figures are still well-known, such as Ibn Sina (Avicenna), Ibn Roshd (Averroes), the Sufi Gazali, and Kindi. 1. In olden time the Arabian desert was, as it is at this day, the roaming-ground of independent Bedouin tribes. With free and healthy minds they contemplated their monotonous world, whose highest charm was the raid, and whose intellectual treasure was the tribal tradition. Neither the achievements of social labour, nor the accomplishments of elegant leisure were known to them. Only on the borders of the desert, in regularly constituted communities, which often had to suffer from the incursions of those Bedouins, a higher degree of civilization had been attained. This was the case in the South, where the ancient kingdom of the Queen of Sheba continued its existence in Christian times under Abyssinian or Persian overlordship. On the West lay Mecca and Medina (Yathrib), by an old caravan route; and Mecca in particular, with its market safe-guarded by a temple, was the centre of a brisk traffic. Lastly on the North, two semi-sovereign States had been formed under Arab princes: towards Persia, the kingdom of the Lakhmids in Hira; and towards Byzantium the dominion of the Gassanids in Syria. In speech and poetry, however, the unity of the Arab nation was set forth to some extent even before Mohammed's time. The poets were the 'men of knowledge' for their people. Their incantations held good as oracles, first of all for their several tribes, but no doubt extending their influence often beyond their own particular septs. 2. Mohammed and his immediate successors, Abu Bekr, Omar, Othman and Ali (622-661) succeeded in inspiring the free sons of the desert, together with the more civilized inhabitants of the coast-lands, with enthusiasm for a joint enterprise. To this circumstance Islam owes its world-position: for Allah showed himself great, and the world was quite small for those who surrendered themselves to him (Muslims). In a short time the whole of Persia was conquered, and the East-Roman empire lost its fairest provinces,--Syria and Egypt. Medina was the seat of the first Caliphs or representatives of the prophet. Then Mohammed's brave son-in-law Ali, and Ali's sons, fell before Moawiya, the able governor of Syria. From that time dates the existence of the party of Ali (Shi‘ites), which in the course of diverse vicissitudes,--now reduced to subjection, now in detached places attaining power,--lives on in history, until it finally incorporates itself with the Persian kingdom in definite opposition to Sunnite Islam. 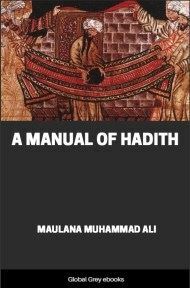 In their struggle against the secular power the Shi‘ites availed themselves of every possible weapon,--even of science. Very early there appears among them the sect of the Kaisanites, which ascribes to Ali and his heirs a superhuman secret lore, by the help of which the inner meaning of the Divine revelation first becomes clear, but which demands from its devotees not less faith in, and absolute obedience to, the possessor of such knowledge, than does the letter of the Koran. (Cf. III, 2 § 1). 3. After the victory of Moawiya, who made Damascus the capital of the Muslim empire, the importance of Medina lay mainly in the spiritual province. It had to content itself with fostering, partly under Jewish and Christian influences, a knowledge of the Law and Tradition. In Damascus, on the other hand, the Omayyads (661-750) conducted the secular government. Under their rule the empire spread from the Atlantic to districts beyond the frontiers of India and Turkestan, and from the Indian Ocean to the Caucasus and the very walls of Constantinople. With this development, however, it had reached its farthest extension. Arabs now assumed everywhere the leading position. They formed a military aristocracy; and the most striking proof of their influence is the fact, that conquered nations with an old and superior civilization accepted the language of their conquerors. 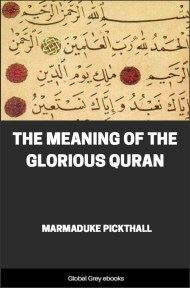 Arabic became the language of Church and State, of Poetry and Science. But while the higher offices in the State and the Army were administered by Arabs in preference, the care of the Arts and Sciences fell, first of all, to Non-Arabs and men of mixed blood. In Syria school-instruction was received from Christians. The chief seats of intellectual culture, however, were Basra and Kufa, in which Arabs and Persians, Muslims, Christians, Jews and Magians rubbed shoulders together. There, where trade and industry were thriving, the beginnings of secular science in Islam must be sought for,--beginnings themselves due to Hellenistic-Christian and Persian influences. 4. The Omayyads were succeeded by the Abbasids (750-1258). To obtain the sovereignty, the latter had granted concessions to the Persians, and had utilized religio-political movements. During the first century of their rule (i.e. up to about 860), though only during that period, the greatness of the empire continued to increase, or at least it held its own. In the year 762, Mansur, the second ruler of this house, founded Bagdad as the new capital,--a city which soon outshone Damascus in worldly splendour, and Basra and Kufa in intellectual illumination. Constantinople alone could be compared to it. Poets and scholars, particularly from the North-Eastern provinces, met together in Bagdad at the court of Mansur (754-775), of Harun (786-809), of Mamun (813-833), and others. Several of the Abbasids had a liking for secular culture, whether for its own sake or to adorn their court, and although they may often have failed to recognize the value of artists and learned men, these at any rate could appreciate the material benefits conferred upon them by their patrons. From the time of Harun at least, there existed in Bagdad a library and a learned institute. Even under Mansur, but especially under Mamun and his successors, translation of the scientific literature of the Greeks into the Arabic tongue went forward, largely through the agency of Syrians; and Abstracts and Commentaries bearing upon these works were also composed.